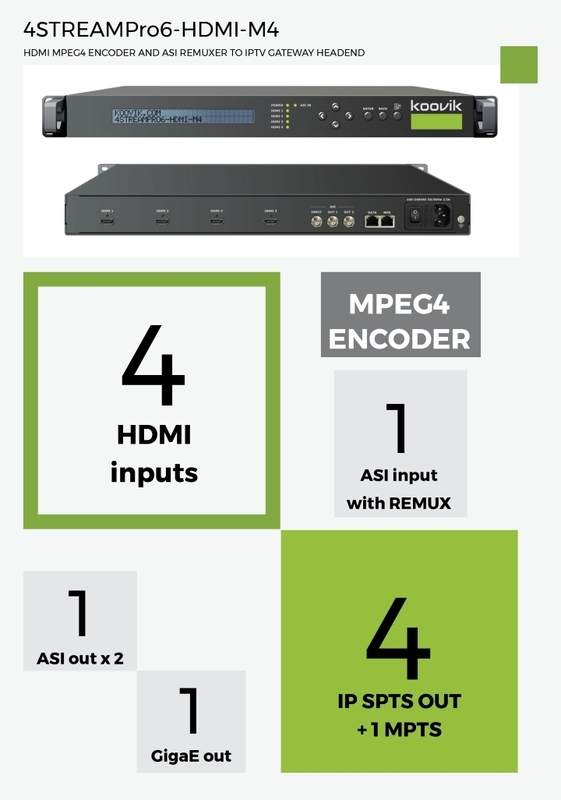 4 HDMI, and 1 ASI INPUTS for feeding in local programs/services. IP SPTS 4 SPTS over UDP or RTP/RTSP. Unicast or Multicast. IP MPTS 1 MPTS with 4 x HDMI TS over UDP or RTP/RTSP REMUXED with ASI. Unicast or Multicast. ASI 1 x ASI ( 2 mirrored ASI outputs ). ASI input REMUXED with 4 x HDMI TS. BNC 75 Ω female. included 1 x mains cable, 1 x ground cable, 4 x HDMI to HDMI cable, 2 x BNC male to BNC male.